Tasmanian Aborigines did not grow up speaking our language as a first language – there is no shame in that. As a consequence of the devastating impacts of invasion and colonisation on every aspect of our lives, we have had to deliberately and arduously restore our language to its spoken life. After two decades, Aboriginal people of all ages can now speak palawa kani, the language of Tasmanian Aborigines, and children learn it from an early age. Read how we, like many other indigenous people around the world, and using the same methods, have brought our language back to life. Most tragic of all, there aren’t enough words or information recorded of any of the original languages to rebuild any one of them exactly as it was. As a result, palawa kani combines words retrieved from as many the original languages as possible. Secondly, you need to look further than published books and compilations of wordlists to find evidence for languages no longer spoken. A wealth of manuscript material from the colonial period is amassed in libraries and other institutions both in Australia and overseas, and this primary source material contains the first-hand observer accounts necessary for the scholarship required to retrieve evidence of sleeping languages. These primary source records, together with a very few later audio recordings of Tasmanian Aboriginal speech, and language remembered into the twentieth century, are the sources for palawa kani. We were able to collect over two hundred words, phrases and song fragments from the memories of over thirty Aboriginal people throughout the twentieth century. Many of these duplicate each other, across different families and time periods, and from both mainland Tasmania and the Bass Strait islands. People living today still sing songs they learned as children, which they have taught their own children, and these are recognisably anglicised versions of songs recorded from Aborigines in the 1830s. It is fortunate that there were so many different recorders of the original languages because this allows us to compare spellings and meanings. The palawa kani Language Program team recognised however that the value of any recording is only as credible as the person who wrote it down. One of the Program’s earliest tasks was to determine the most accurate, hence most reliable, recorders of the sounds and meanings. This enabled us to identify the strengths and weaknesses of individual recorders. These factors are taken into account with every word revived. To retrieve the authentic sounds of each individual word, those spellings from the recorders are analysed through a linguistic process called ‘reconstruction’. ‘Reconstruction’ is a linguistic term for a standard process used world-wide in the recovery of languages which are sleeping or no longer spoken; most of these are indigenous languages. Unfortunately this term is too easily misunderstood or wilfully misinterpreted. It does not mean ‘to construct’ a language, or ‘to create’ one – in the sense of just making things up from no evidence, or randomly selecting European spellings from wordlists, and claiming those words to be ‘language’. On the contrary, it is a rigorous process by which linguists and language workers recover the original sounds and meanings of the words of a language from all the recorded versions of the words. For words for places and tribes, further historical and geographical research is often also necessary, together with knowledge still held within the Aboriginal community today. Only this thorough research ensures that words revived are, as far as possible, from the original language of the place. Taking information from wordlists at face value is how mistakes are made. A good example of this is the name for the Mersey River. tulaminakali (spelt ‘tollumenergully’ by Robinson) is the proper name. This is a word from the Port Sorell language, the northern language spoken in that area, and shared with Robinson when he travelled with two Port Sorell tribespeople in April 1832 to the Mersey River and the ochre site on the Gog Range. tulaminakali shares characteristics with the name of that important ochre site – tulampanga – and with other northern language names for places in that area. Yet another word in its English spelling – ‘paranaple’ – has been selected to name the Devonport Arts Centre; a word with no information at all about its provenance, recorded at Wybalenna by a recorder who, by his own admission, did not know the people well nor where they were from; and which, in a related form is also recorded to mean the Tamar River. Applying this methodical process to the evidence from all the historical sources gives us the best chance to revive authentic Tasmanian Aboriginal language, as close as possible to the way it sounded before contact with European or other languages. However, palawa kani is not exactly the same as any of the original Tasmanian Aboriginal languages. Participants in community workshops of 1993 and 1994 understood that the remnants of each of the original languages were not enough to revive any single one of them, but that one language could be retrieved from the records of them all. This mirrored the way in which the families of the survivors of the invasion, from wherever they all now lived throughout Tasmania, had since coalesced into one statewide Aboriginal community; and the language remembered in families from both the Bass Strait Islands and Channel areas also shows that a ‘mix’ of words from several original languages had been used from at least the start of Robinson’s ‘Mission’ and then throughout the Wybalenna period. It was also believed that the revived language would inevitably need to rely upon grammatical features of English, as little or no evidence was thought to remain of original grammar. This was the assessment of some earlier linguists, based on small samples of records in wordlists. Since that time, the painstaking examination, word by word, of the original languages for the first time ever, by the palawa kani Program, has revealed clear evidence in the original languages of consistent patterns of use and grammatical functions which are now continued in palawa kani: ways to make plurals, word orders different to English, a range of suffixes to denote specific functions, borrowings, adaptation of traditional words to talk about things newly introduced by Europeans, to list a few. Such grammatical structure is an integral element of an actual functioning language; and cannot possibly be gleaned from grabbing isolated words from wordlists. So when people trawl through Plomley’s Wordlist, the 1966 compilation of most (but not all) of the recorders’ wordlists, for any one ‘word’ they may find an array of multiple and differing spellings. Faced with this, most people looking for an Aboriginal language word, simply opt for the easiest to say or the one with the prettiest or most fanciful translation. So, some twenty years on, isn’t it wonderful that we can honour the memory of the original languages and their speakers– our Ancestors – by bringing back into use those words that have until recently been resting. palawa kani Dictionaries and other learning materials are available from each regional TAC offices to all Aborigines eligible for TAC services. Policies determining Aboriginal language use are based on the principle of Aboriginal control. These policies are set by the Aboriginal community through the Tasmanian Aboriginal Centre. Flowing on from the revival of the palawa kani language has been the eventual state government recognition of the original names of some places in lutruwita. There are currently 13 officially gazetted Aboriginal or Dual names, one National Park (Narawntapu) and two community- allocated names for Aboriginal Land. Marking seasons and events in the calendar, with cultural themes yet to come. 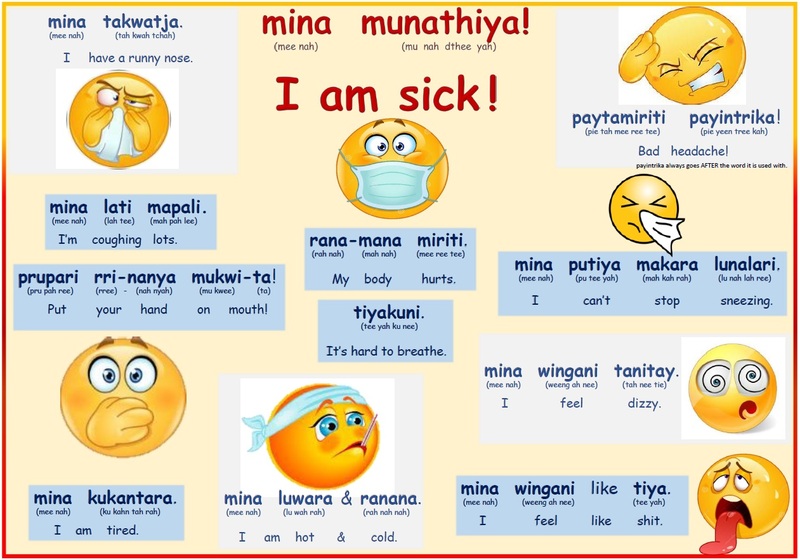 These palawa kani posters can be enjoyed on this website, with accompanying audio. In recent years, much work has gone into digitising the language materials into a database that is made available in Tasmanian Aboriginal Centre facilities around the state. The multi-media materials catalogued include documents, supporting images and audio recordings. The second phase of this digitising process has seen the creation of two language apps, allowing users to read and hear words, either singly or through building phrases. A record function also lets them note their improvement in speaking the language over time. This takes place in structured learning environments, such as the Aboriginal Children’s Centre in Hobart, the luwutina Children’s Centre in Launceston and across the TAC’s child and family programs statewide. Some of the language material displayed on this website was produced with the assistance of funding from Indigenous Languages and Arts, Australian Attorney-General’s Department.